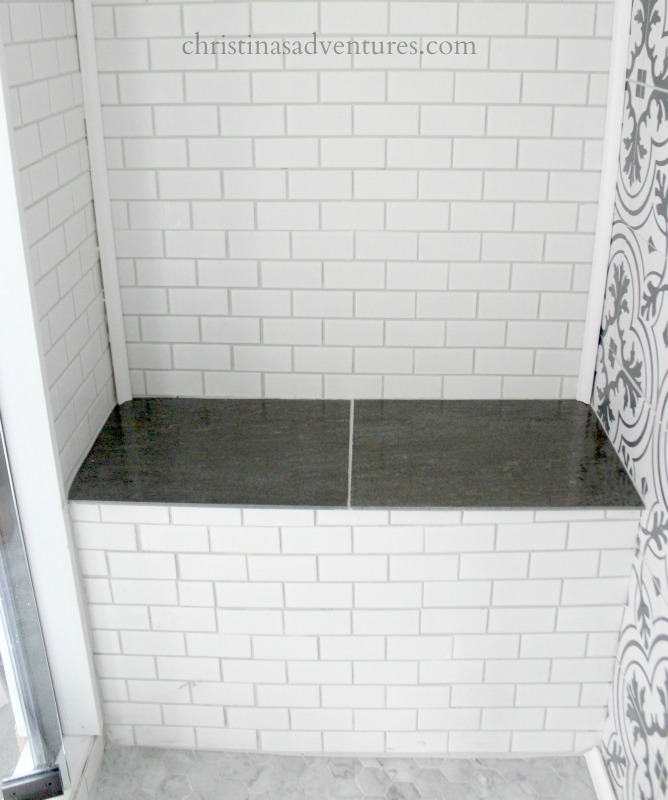 This walk in shower design combines subway tile, black and white patterned tile, and a hex tile floor. 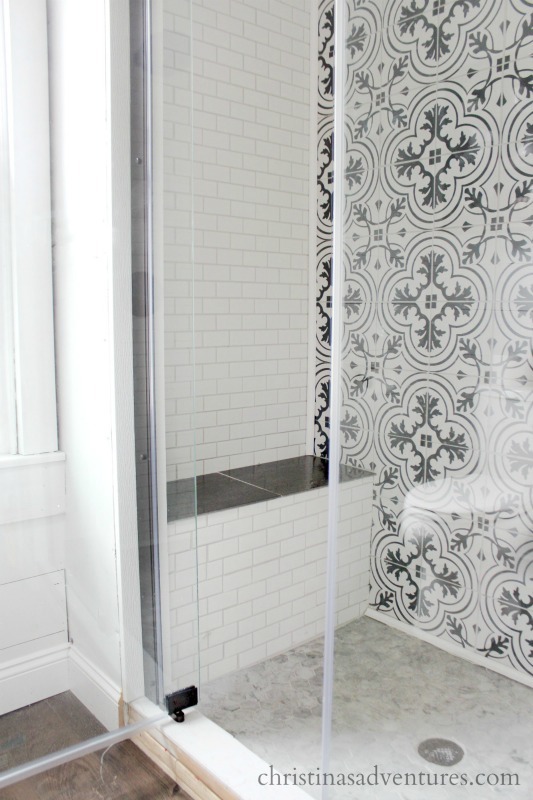 A glass shower door and a gooseneck shower head completes the look. This post contains affiliate links. Oh man, I am so glad I can *finally* write this post. We finished our bathroom in 6 weeks, (see the whole makeover here) but didn’t get to finish this shower in that timeframe. Little did I know it would be many more weeks until we actually had a functional shower again! 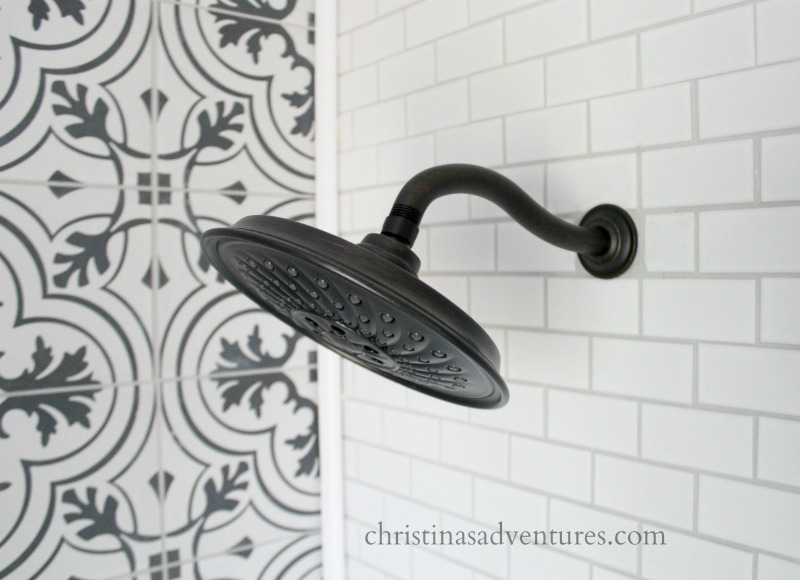 To all of my blog readers and Instagram friends who have been asking – here’s *everything* you need to know about this shower! I’m sorry it took so long! Getting this shower to where it is today was a *major* ordeal. 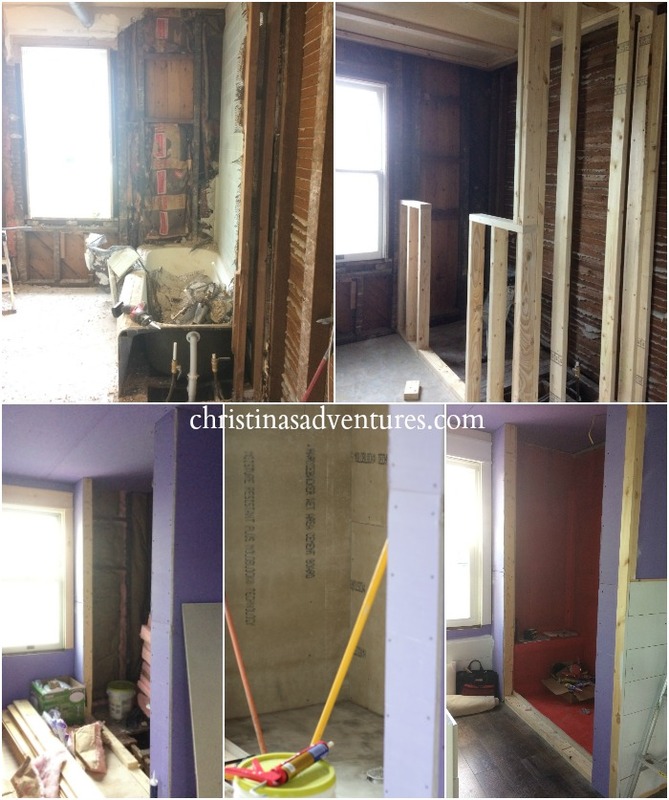 We had our contractor help frame it out, build the wet bed, and install the backerboard. But we did the thinset, tiling, grouting & finishing ourselves. 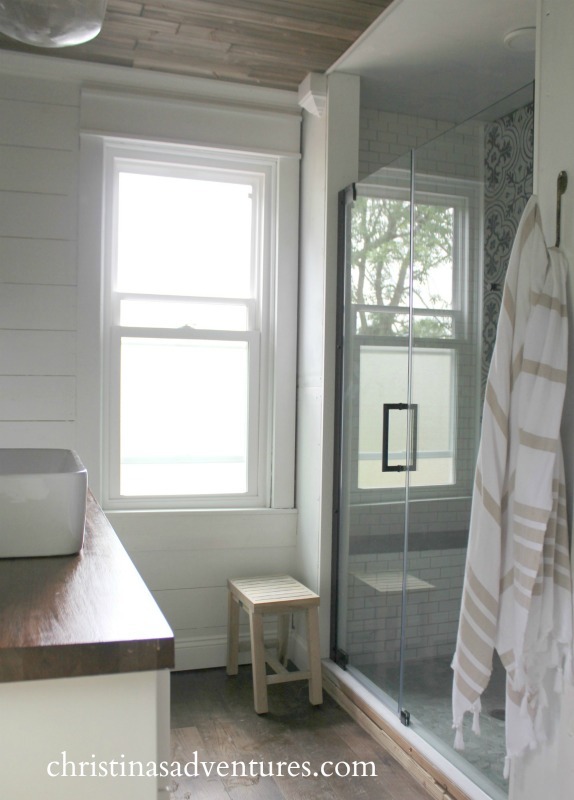 You can see that we had to change the original layout of the shower – I had planned on having a glass door and then glass panels on the upper sides of the door, and then drywall under those panels. BUT then we got an estimate from a local glass supplier and it was going to be $2100 for just the door & 2 glass panels. Um, yeah, no. Out of budget. So I bought this shower door (more on that later in the post) and we built the shower to fit that door instead. 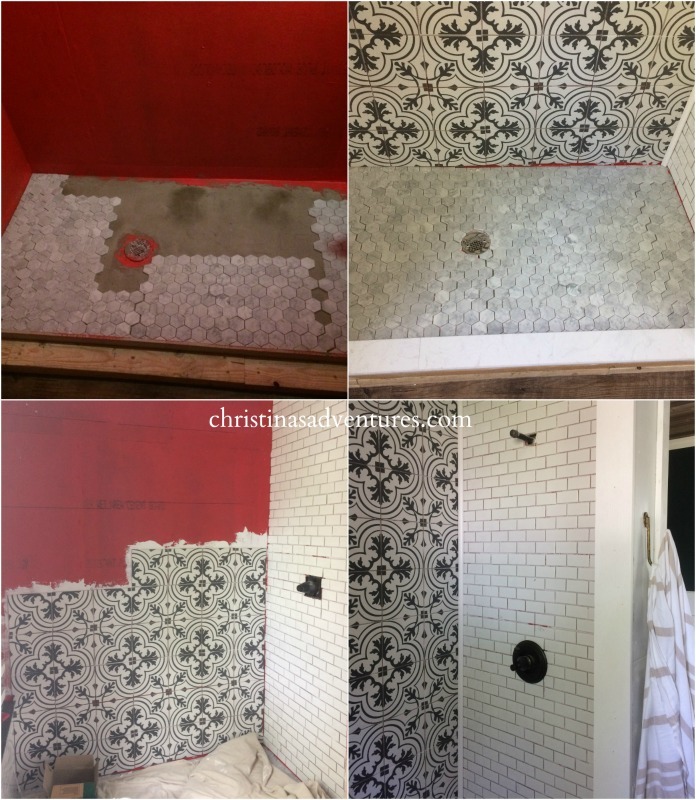 Here’s the tiles we used – You can read all about the tile choices in this post. I went into detail about each of them there – make sure you read before purchasing any of them! So – this shower door. It was such a frustrating purchase! Here’s the one we bought…we got it through Lowe’s, but it was through a company called Dreamline. I ordered it a month before we needed it, and then the delivery date got pushed back TWO times so it ended up coming TWO months after we originally ordered it. And this was after lots of phone calls and follow-up. It was so frustrating. So – I guess I’m saying – order at your own risk. I like the actual shower door, but honestly I may have ordered another one if I would have known how long it would have been backordered. 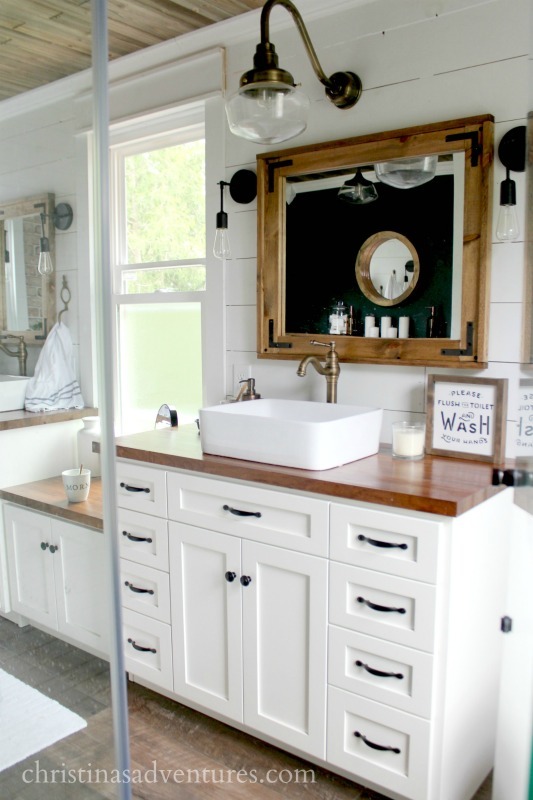 See the rest of our vintage inspired farmhouse bathroom makeover pictures here. I really love the shower system we got – but be warned – it got bad reviews. I bought it in the store, and I probably wouldn’t have bought it if I would have seen the reviews first. But I’m not sure why it got bad reviews – I really like it! Love this sweet little bench – my kids use it to get to the sink to brush their teeth. 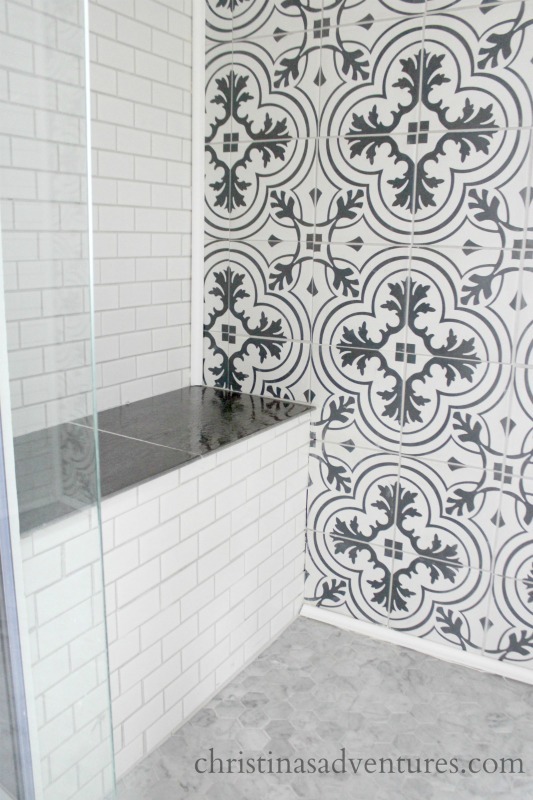 This is the grout we used on all of the tiles – I think the color worked well for all of them! 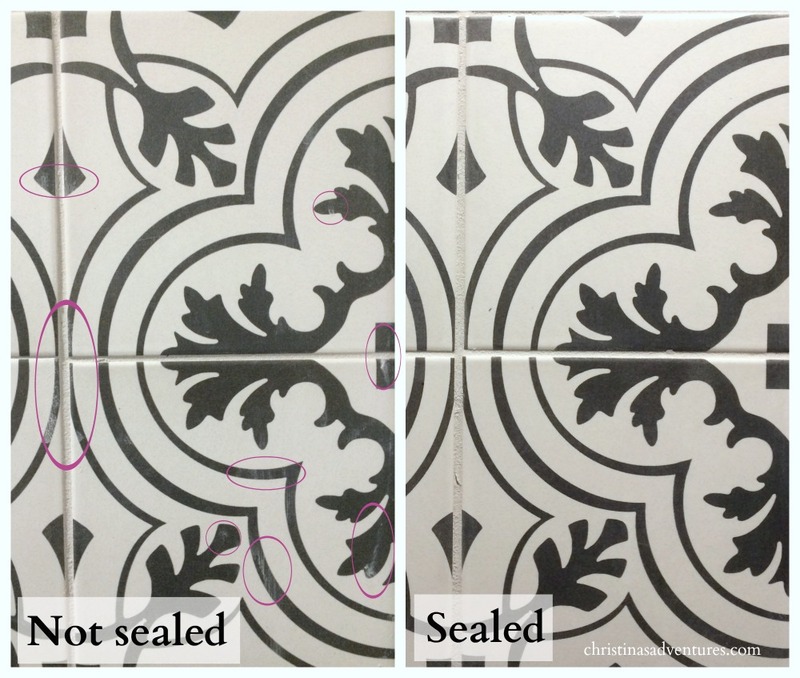 One last note: make sure you seal your patterned tiles. I learned this the hard way! On the left, you can see that the grout left marks and stains on the tile. On the right, after we used the tile sealer, there were no grout stains. We have a few stained tiles from our mistake, but most of the shower was sealed once we realized our mistake. This is the sealer we used – it worked perfectly. And now – we *finally* have a functional shower again. It took a few months – but it’s done! Make sure you see the rest of the bathroom makeover here – we are in LOVE with the whole transformation! All sources/paint colors are listed there as well. Bathroom looks beautiful! It is a shame you ended up with that dreamline unit and headaches involved. I work for a glass company and the $2,100 for a three piece enclosure like you originally had there seems about right installed. However with your new layout you could have gotten a single door with wall mount hinges and matching fixed panel installed in the $1,600 price range. You would of obviously not had the shelf brackets, but would not of had any of the large metal going up both sides of the unit. The glass would have been cut out of square to match your right wall as well eliminating the difference in reveals you see on your metal. I understand it would of been more costly but you would of had it installed in 3 weeks and had a warranty to back the product and a much nicer overall look. The initial price point sends a lot of people to the Dreamline product line, but in the end you get what you pay for. My 2 cents for what it is worth! I love all of the things you’ve done. Can’t wait to get your emails. Christina the shower is beautiful! How are the patterned ceramic tiles holding up? 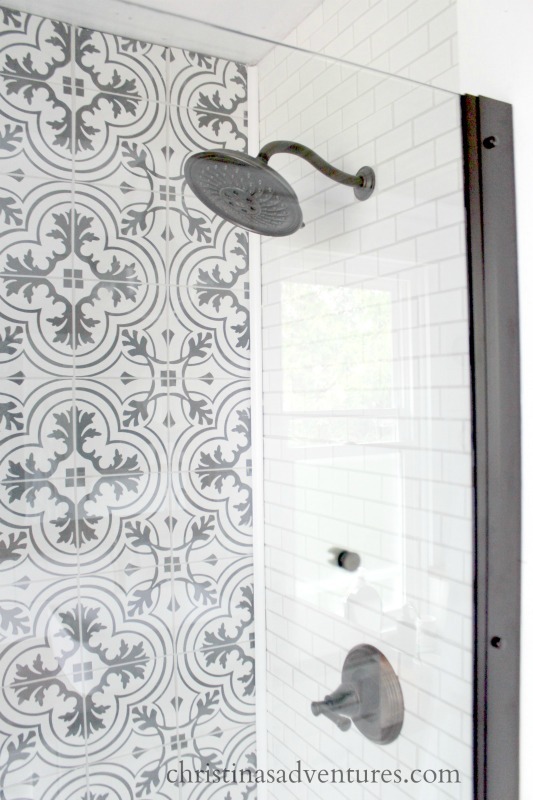 They are really stunning and are inspiring me to think outside the box for our bathroom remodel. Great taste and great job! They’re absolutely perfect and hide any water spots really really well – SO glad we went with them and I’d totally recommend to anyone! I love the decorative grey tiles. They look very pale in a couple of the pictures. I am looking for a pale grey decorative tile. Is it just the lighting? Where did you get them? They’re available at Home Depot and Wayfair. I ordered a sample at Home Depot. Christine has a link up in the post. We purchased these same patterned tiles for our front porch floor remodel. 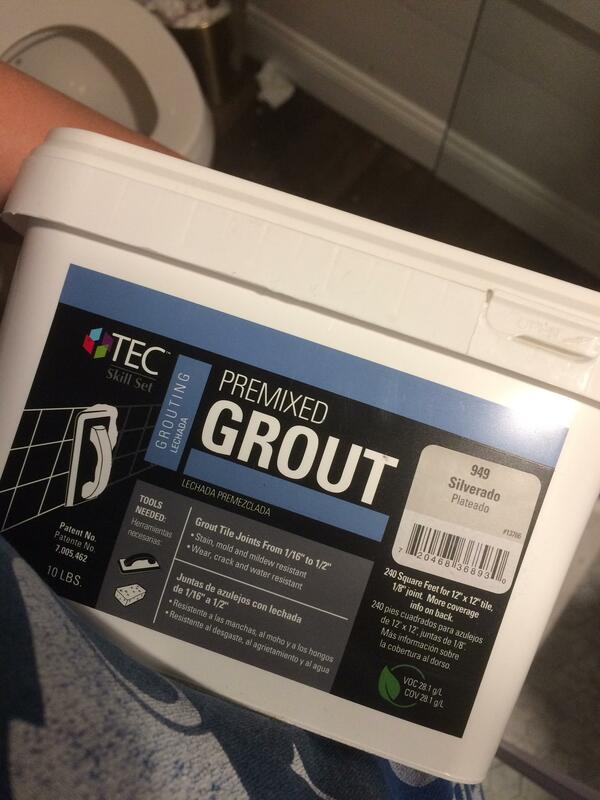 Did you seal them before applying the grout? Or after? Thinking of using these tiles on my laundry/ mud room/ bathroom floor. The bathroom also serves as a pool splash room. My question is, do you think they would work well for a non-slip floor? 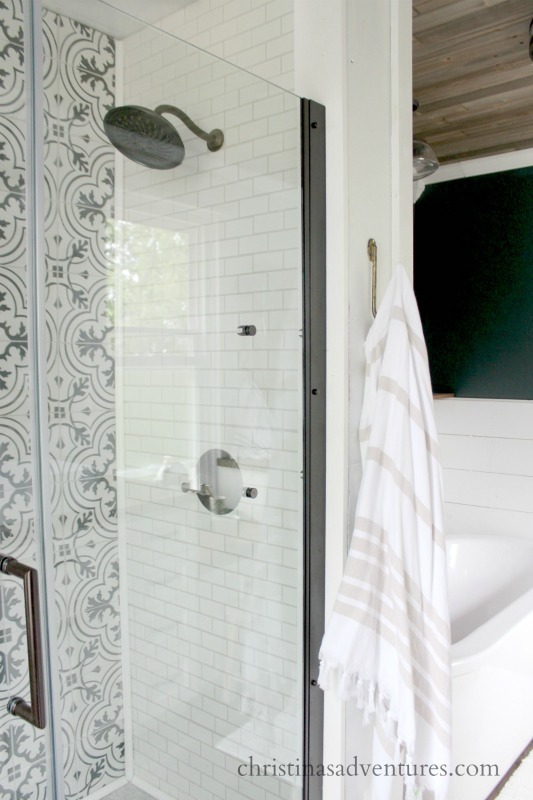 Did you use a bullnose trim for the subway tile?…or is that what the pvc molding is for? I really like the subway tile you used but my contractor said I need the bullnosetrim for it and wayfair doesn’t sell it. Any thoughts? We didn’t use bullnose because it goes flush against the walls, floor & ceiling- sorry!